I've had many android phones over the years, so last year when I switched to the Samsung S7 Edge I didn't expect any real issues with a learning curve. 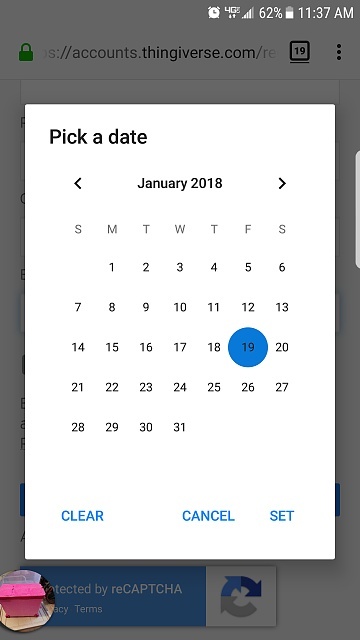 I've had several new apps, since this edition of the phone, and if you have to put in a birthdate, it doesn't allow you to pick a year and then separate month and date, it starts with a current calendar and you have to scroll backward through YEARS UPON YEARS of calendars. I'm 57 years old, I have to scroll through calendars all the way back to 1959, meaning I have to slide the calendar 684 times to get to my birthday. I've never had this issue with any other android phone. Anyone have ANY IDEAS on how to change this so that I don't have to wear out my finger scrolling backward for years? You can flick it. You don't need to scroll slowly. I mean a single flick can scroll the thing like 30 years. I'll try that, next time! I don't have the option of scrolling through the years, I truly get a calendar and have to flick back 57 years times 12. It wears out the finger, and when I was doing this the other day I had made a mistake somewhere in the form and it made me start over, so not only did I flick 684 times, I had to do it TWICE! Ok. That's weird. What software version are you on? Wait you said apps. I think that would depend on the app and not the phone. I'm finding this on a bunch of new apps and web pages on my s7 edge as well and it's infuriating! I'm over 40 why in God's name did they remove the option of toggling the year? The developers doing it should be flogged. I've deleted several apps for having it this way. If you kind people have a work around I'd be eternally grateful. I attached a screen shot of the offending dialog box. You can see no way to toggle the year. I just figured out that if you click on the year it pulls up the years and you can scroll through the years quickly by flicking your finger quickly. Hope this helps. Some can, some cannot. Specifically, I was complaining about the app IBOTTA here. There is no way to toggle it on the phone. You can on a computer, which I ultimately used. Some, you can click on the year, some don't even display the year, others don't toggle no matter what you do the year. Why will half of my music not show up in Google Play Music?